I'm loving the fact that Middle School now means the kids have enough time to eat. 30 minutes instead of the Elementary 15. Of course now they don't get recess which I think is insane. They are still kids and still need to run around, but anyway. Longer lunch time means Kidlet has time to actually eat his food! He loves to eat salad and so that is what he gets today! Kidlet has a salad of lettuce, carrots, and bell peppers. The little puppy container holds Asiago Caesar Dressing (one of the few vegetarian Caesar's we can easily find!) 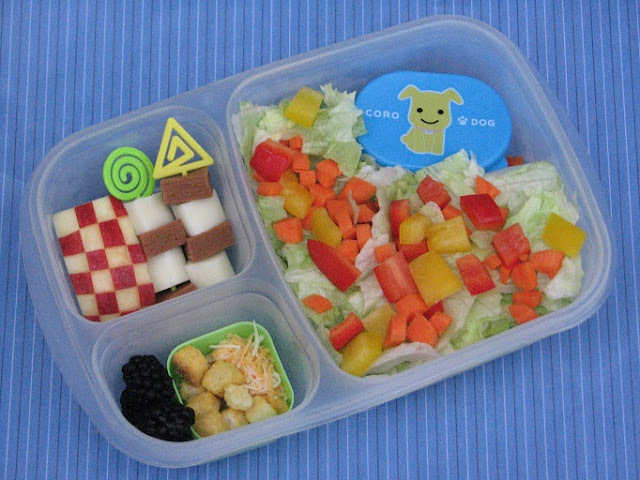 In the small side there are blueberries and a container with shredded cheese and croutons for the salad. In the bigger container there is a checkered apple and some soy ham and cheese skewers. I'm appalled Kidlet only had 15 minutes to eat in elementary school! Ours get 25! I love this one. And love that they have more time to eat, yeah!